First held in 1983, this is New Zealand’s longest running Triathlon. While the thought of running, swimming and cycling just days after a Christmas feast is terrifying for some, triathlon participants train year round for this popular event. Located off the Gibbston Highway at the Lake Hayes Showground and Pavilion, tickets for entrants are available here. The jetboat is the preferred mode of adventure travel around Queenstown. From Dart River and Mt Aspiring National Park to Shotover and Kawarau Rivers, there’s waterways aplenty to explore around Queenstown in the summer. Most jetboat providers operate throughout the holiday season. Check out some of the best jetboat adventures in Queenstown here and book the adventure of a lifetime. Looking for the ultimate thrill seeking adventure? Nothing beats gliding a few thousand feet over Queenstown, taking in the incredible natural environments from a bird’s eye view. There’s a number of providers around Queenstown including NZGforce and Skytrek.co.nz. Nothing says summer in the southern hemisphere like a barbecue on the lake. While the rest of the world freezes, the summer season is the perfect time to enjoy lunch (or dinner) by Lake Wakatipu. Bring a towel and some bathers and you might even find yourself splashing around in the water. There's no better time than summer to experience the scenic beauty of Queenstown and Lake Wakatipu. At over a century old, the TSS Earnslaw is a steam ship from another era. Take the family down to the engine room and see the steam engines at work. Travel back to the early 20th Century in the ship’s museum, or just kick back and enjoy a drink at the onboard Promenade Cafe and Bar. The cruise takes about 90 minutes and there are several trips throughout the day. Cruisers can also check out the Walter Peak High Country Farm. Book a trip on the TSS Earnslaw here. Take the plunge and skydive tandem from 12,000 or 15,000 feet. 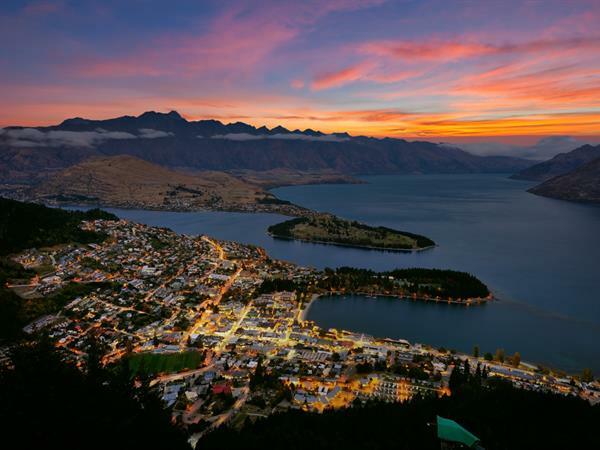 See the breaktaking Lake Wakatipu and take in iconic scenery surrounding Queenstown from soaring heights. Check out Skydive Paradise and their Glenorchy drop zone for the ultimate skydiving adventure. Queenstown’s iconic Skyline gondola is open from 9am every morning, 365 days a year. Travel all the way to Bob’s Peak then hop a luge down to the bottom or jump on a mountain bike and plot your own route home. Skyline also has a restaurant up top, haka performances and stargazing by night! WIth breathtaking views and perfect summer weather, a stress free hike through the Fiordland and Mt Aspiring national parks are just what the doctor ordered for overstuffed revellers looking to walk off all that Christmas pudding. For the truly adventurous, there are a number of multi day hikes around Queenstown. Ask your hotel concierge to put you in touch with experienced hiking guides. ● Botswana Butchery - Enjoy a three course meal at this sumptuous restaurant and bar. Private rooms are available, so book now. ● Stratosfare Restaurant (Skyline) - Enjoy panoramic views of Queenstown, the mountains and lakes while you feast at the Stratosfare restaurant. ● The Waterfront Bar & Bistro - Located at the Steamer Wharf, The Waterfront is a casual dining experience with memorable meals, great views, wine and beers on tap. ● Pier 19 Restaurant - Pier 19 serves delicious seasonal meals to its patrons, and has a wonderful view to keep you entertained as you eat. WIth bright and beautiful weather over the holiday period, summer in Queenstown is packed with activities for kids. Check out these kid friendly events, and be sure to bring a camera! Meet eels, trout and ducks beneath the waters of Lake Wakatipu. Storyboards for the kids tell of ancient Maori myths, and there’s plenty to learn about the local species as well. Located at the Main Tower Pier on Marine Parade, tickets start at $10 for adults and $5 for kids. Located on Upper Brecon Street, the Kiwi Birdlife Park boasts 5 acres of forest sanctuary and features daily shows and talks. It’s a great way for animal lovers of all ages to get to know our winged and feathered friends. Tickets start at $40 for adults and $20 for kids. Although Queenstown is best known for being a winter wonderland, visiting summer in Queenstown is sure not to disappoint. An incredible mix of breathtaking views, great food, adventurous outdoor activities and more, Queenstown is the perfect place to spend the warmer months.